the U.S., eventually settling in Chicago. Paris. Three years later, Garden made her professional singing debut at the Opera Comiqué in Charpentier's Louise. Soon she was selling out opera houses throughout the world. the production was cancelled. "Miss Garden," protested Chicago's chief of police Leroy T. Steward, "wallowed around like a cat in a bed of catnip." 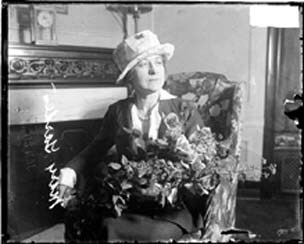 Garden continued performing and, in 1921, was named general director of the Chicago Opera Association. Her tempestuous tenure lasted only one year, but even critics admitted that it was a brilliant one. When the COA was reorganized into the Chicago Civic Opera in 1922, Garden continued to perform and please the crowds until her farewell performance in 1934. During most of her professional life in Chicago, Garden lived here at the former Blackstone Hotel, 636 South Michigan Avenue.